What if God had used a Tarot reading as a blueprint to create the universe? And what if we could use the Tarot cards to see what God’s reading was like? Impossible? Of course. Nevertheless, in her book, The Forest of Souls, Rachel Pollack “plays seriously” with outrageous ideas like this in order to explore both spirituality and the Tarot in unique and extraordinary ways. This innovative spirit, as well as the eloquence of Pollack’s writing, moved me to write a review of this book, but as I began to put my thoughts in order, I was faced with quite a challenge, for this is not your ordinary Tarot book. In fact, The Forest of Souls seems to defy categorization. Is it about Tarot cards and how to read them? Is it about spirituality, or mythology, or philosophy? Is it about using the Tarot to answer spiritual questions? This book touches upon all of these things and more, but also it is greater than the sum of its parts, which is a testament to its innovation, depth, and allure. Perhaps Pollack explains it best when she says, “Tarot is the instrument of our wisdom,” in which case, her book is like a lyrical concerto played on that instrument. Where, then, does The Forest of Souls take us? For one thing, it delves deep into the heart of the Tarot, moving far beyond the façade of formulaic card meanings. Thus, this is not a beginner’s Tarot book, although Pollack wrote it in such a way that anyone from a novice to an expert could enjoy its exploration of the mysteries of the universe, the Tarot, and our souls. To take us on this mystical journey, Pollack examines the Tarot through discussions of symbolism, philosophy, mythology, religion, spirituality, literature, and even pop culture. A more amazing accomplishment, however, is her ability to do the reverse, to explore this myriad of subjects through discussions of the Tarot. For example, in Chapter 14: A Short Leap to the Place of the Fool, Pollack addresses the question of the Fool’s placement in the Major Arcana. Although today the Fool is usually placed at the beginning of the Major Arcana, another ordering, which was developed by Eliphas Lévi in the Nineteenth Century, places the Fool between Judgement and the World. But Pollack avoids engaging in a superficial argument about which method is right, or even which one is better. As she says, she “would rather play with many possible meanings than insist on one absolute truth.” Thus, she uses these alternatives as a jumping off point to explore the Fool card itself and to take us on yet another journey into a realm of philosophical and spiritual wonder. Perhaps the most daring aspect of The Forest of Souls, however, is its use of actual Tarot readings to examine mystical topics ranging from questions about nourishing our souls to the reading about God’s use of the Tarot that was mentioned at the beginning of this article. Pollack tackles these amazing readings with wisdom and insight, courage and conviction, and joy and playfulness. 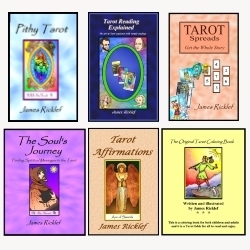 The result is a collection of Tarot readings that are as entertaining and inspiring as they are informative, and that read more like esoteric detective stories than treatises on spirituality and the Tarot. This spirit of fun and delight pervades and enlivens this book. In her introduction, Pollack says that she asks only that we have “a willingness to look at the Tarot in a fresh way,” but I would add that enjoyment of this book is greatly enhanced by a willingness to play along with the author as she plays with the cards. For example, Pollack ends The Forest of Souls with an explanation of how we can play with the Major Arcana in order to take our own walk through the Tarot—either to find spiritual meaning or just for the sheer joy of it—which brings me back to the question of how to explain what this book is about. At one point, Pollack talks about “Three Levels of Tarot, Three Levels of Reader.” She calls these three levels Practical (using the cards to do readings for specific, earthly questions), Creative (using the Tarot for spiritual transformation via meditations, visualizations, etc. ), and Frontier (loving the card images in order to experience the transcendent joy of life through them). Similarly, I found there to be three levels of The Forest of Souls. On one level, we can use it to learn about the cards and related esoteric topics. On another level, its journeys through the Tarot can help us along our own journey of spiritual transformation. Beyond that, however, there is another level: the sheer delight of reading this book as we share Pollack’s sense of wonder and awe of the universe through her use of “serious play.” And so I found that I could not categorize this book because its value lies not only in what we can learn from it, but also in the wondrous experience of reading it. Perhaps, though, we can say that this book is about mystery and wonder and joy. in 2002 by Llewellyn Publications, St. Paul, MN.